Wire Rope Lanyards – Tyler Madison, Inc. The term wire rope lanyard covers a very broad range of wire rope products, and wire rope lanyards can be extensively customized to meet the needs of a multitude of applications. Like any other wire rope, lanyards are created by, first, twisting strands of metal wires into a helix. This bundle of twisted wires can then be twisted together with other similar bundles in the same fashion as before to form the wire rope lanyard. Depending on the strength requirements of the intended application, different numbers of each set of strands can be used. For example, a common wire rope lanyard construction consists of a bundle of nineteen small wires being twisted together with seven other similar bundles. This is called a 7×19 construction, with the first number representing the number of bundles and the second number representing the number of wires in each bundle. Other common construction types include 1×19, 7×7, 6×19, 6×25, 8×19, and 8×25. Many other features of wire rope lanyards can also be customized, including cable material, cable coating, and fittings. Steel is the most commonly used material in manufacturing these products, and some manufacturers will offer stainless steel cables, galvanized steel, and other more unique metal options. Cables can also be coated with a variety of different plastic materials to make the cable easier to work with as well as to enhance the aesthetics of the product. 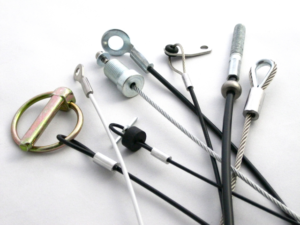 To really customize your wire rope lanyard, you can also select from a wide range of end fittings and terminals. These can drastically alter how the cable can be used. Thimbles, handles, stops, strap eyes, threaded studs, and ball terminals are just a few of the many fitting options at your disposal. Wire Rope Lanyards Wire rope lanyards, or cable assemblies, are cables which are comprised of many spiraled bundles of wire. 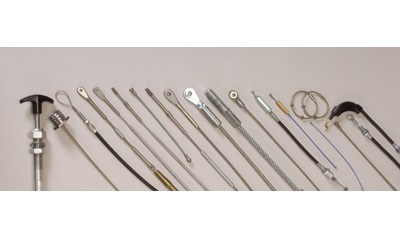 These cables are used to support hanging objects, connect objects, pull or lift objects, secure items, and much more.